When the girls come back we have a great breakfast together (I already miss your food Saura) and as we are talking about mantras I change the music playing my favourite bajhans now. We talk about the sound massage I did a few days ago too. None of them has tried yet so I offer after breakfast. Morning sun, Mantras, the powerful place and the people around create a very special energy making me enjoy to make the sound in a way not to be described by words! Sukha stand up early just to say good bye and I get a flower necklace from Saura even though I will be back soon. He makes a lot of jokes telling me he will come with me. Saura, if you were a girl, I´d marry you straight away! 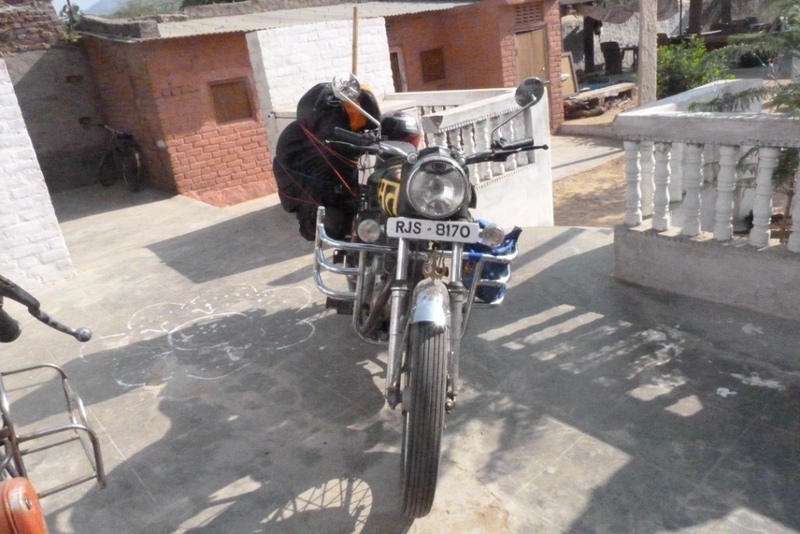 When I am about to leave I see that I have to repack my bike like Saura and Lalit had predicted. Its not in balance at all and riding is very hard. I want to stop for a chai at Rajus place anyway so I decide to repack there. Raju is unfortunately at the market and I realize I have much better tools for packing in suryananda… So back to Sukha place, pack properly and chalo finally at lunchtime. I pass the well known streets of Ajmer quickly and as soon as I am on the highway I stop at the first chai shop. Om tat sat makes easily up to 120 km per hour and its way cooler than with suryananda. I realize I really have to get used packing a bike again. I have to completely unpack to get the pullover and a warm jacket! 50km further I stop again for the same reason. I have chai first and want to pay before dressing more (which requires completely unpacking again). I give the usual 5 Rupees to the chai wallah but he demands ten. Using all the little hindi I know I have a short discussion about tourist prices before I turn around to go without giving him one more rupee. I take some time to start to give him some time to run after me but I decide not to do the unpacking action here. Dressed very warm I enjoy riding a lot, the street is in awesome good condition (little boring though: straight and flat) and short before sunset I have done little more than 200km. I am used to have an eye at the petrol so I stop at a petrol pump. 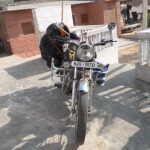 I have 1200 rupees in my pocket, not eaten and no place to sleep yet…. “900 Rupees” I say but at 550 I am nearly full, at 600 we have little more than when making full in Ajmer 210km ago. This means we need on 100 km ten liter less than suryananda – 4l we need! Sometimes I really miss her (thinking about the sleeping problem) but either for warmth, music and privacy! Around sunset I suddenly have to stop for a few minutes as the road is entirely blocked. A few kilometers ahead, at a railway crossing (! ), an accident had happened. I cant figure what exactly happened but I hope nobody is hurt to bad. I pass the Indian way using the smallest slot to sneak through cars and trucks so I can pass pretty quickly. Driving at night is very exhausting so after using the last daylight I stop at a roadside restaurant to get some food. It is amazing and even more is the cook who loves me for loving his food. Of course I get second (as well as third and fourth) service. By now it is completely dark so the guys ask me where I will spend the night. I want to do some more way but they suggest I should sleep at there shop. I can take a bed in the backside area and don’t even need to unpack as I can park Om tat sat right next to the bed! Bolenath! This is my first blog entry written by hand. Not like last time in india (when writing everything by hand), this time I have my own computer with me for the first time to do the writing. Still at this place it feels strange to unpack it and sit here having a computer in front of me. 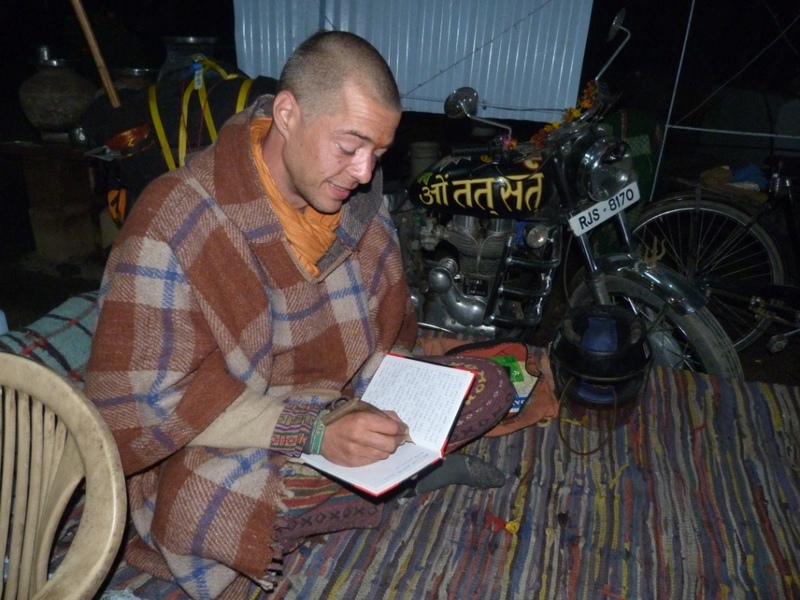 I enjoy writing by hand and I enjoy all about the life on the road – like stopping and sleeping anywhere – too much! Love your blog! Living through you Good luck with your adventures!